The entry leads to a standing cross. 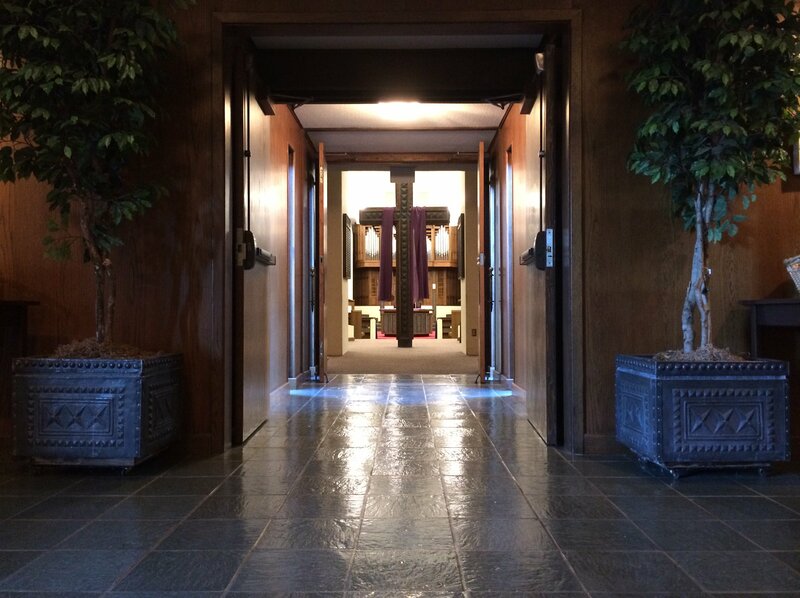 Just beyond the cross is the baptismal font, the communion table, and the pulpit. These symbols of the faith are aligned in architecture as they should be in faith. The seating arrangement is stadium-like; there are pews, but tiered seating allows everyone a clear view of the room. Parkway also has kneeling benches at each pew, an unusual feature in a Presbyterian Church. Those who wish to are encouraged to kneel for the prayers during worship. Six copper reliefs surround the sanctuary as an artistic expressions of great events of the Bible. Music plays a leading role in worship. In the sanctuary we have a pipe organ, piano, harpsichord, and hand bells.